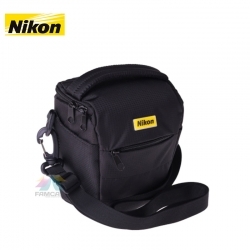 Compact and secure,The Nikon Design DSLR Camera and Lens Toploader Bag 0922 Black has integrated security features for protection when traveling and features a boomerang handle that connects to dual zippers to quickly open the main compartment from the top. This compartment protects a DSLR with an attached lens and has a soft lining with a padded touch-fastened divider. For your accessories, there is an exterior front zippered compartment with an interior organizer for items such as your memory cards, smartphone, a pen and keys. The bag can be carried using the top grip handle or the convertible, adjustable Carrysafe Slashguard strap, which has a comfort pad and detaches from one side.